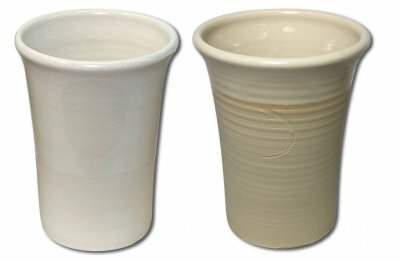 Most often the term "stoneware" refers to a high fired (about 1200C+) ceramic clay:feldspar:quartz blend that is semi-vitreous (not translucent and not zero porosity). To appreciate the scope that stoneware can encompass it is helpful to contrast it with porcelains (this description is for people who make stoneware, not users): Stonewares fire darker colors, are less dense (have higher porosity), are less vitreous, the fired surface is less homogeneous, the fired shrinkage is less and the fired strength is lower. The working properties of stonewares are more robust, they dry with fewer cracks yet are more plastic, they often have coarser texture (although they can be very slick and smooth), they can be fired more rapidly and are more stable and warp-resistant in the kiln. Stonewares are less expensive, often dramatically so. 'Whiteware' is a subset of stoneware, it fires white like porcelains but is not zero-porosity (thus not highly vitreous). Stonewares can be glazed to create ware that approaches the strength of porcelains. Stoneware bodies are thus more practical for the vast majority of ware made by industry, potters and hobbyists. Industrial stonewares are typically glazed with opaque and colored glazes, the body is fine particled. Stonewares used by potters and traditional potteries generally employ less refined materials, even fireclays, they can fire brown, grey, buff or off-white. They also commonly have some fired-speckle-producing impurities and some particulate material, such as sand or fine grog, that impart texture. Stonewares are noted for their excellent working properties, this is because they are ball-clay-based rather than kaolin-based (although they can contain some kaolin). Ball clay levels can be as high as 70% in some super-plastic versions, this is possible because many ball clays are quite vitreous at higher temperatures and they contain significant natural quartz (meaning that only small additions of feldspar and/or quartz are needed). Some natural stoneware clays have sufficient levels of plasticity, quartz and feldspar that they can be used as stoneware with no additions (Plainsman Clays mine such materials from the Whitemud Formation in Saskatchewan, Canada). When stonewares employ more coarsely ground clay materials they often have a minimum safe density. That means that during final stages of firing bloating will begin before zero porosity is attained - this happens because feldspars are densifying the matrix while certain larger particles are still decomposing and generating gases. Fired maturity studies (measuring fired shrinkage and porosity over a range of temperatures) are important to establish a compromise firing temperature that produces adequate strength while having a margin against bloating. 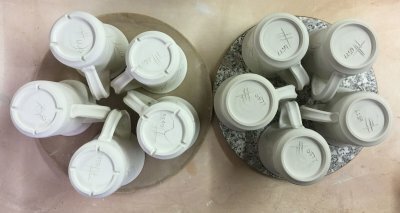 Some believe that a stoneware can be identified by calculations that reveal that it has a particular chemistry profile or ratio of one oxide to another. However this is misguided. Many of the mineral particles in bodies are aggregates that do not interact chemically (either because of size, crystal structure or identity), they exhibit their influence because of physical factors, not chemical. Others that do decompose, alter or react do so to an extent controlled as much by their size, mineralogy and interactions as by their chemistry. It is better to identify stoneware by the physical fired character. The quartz particles in stonewares form a skeletal structure that imparts strength during firing. Voids between the particles find feldspars melting and bonding the structure and the crystal transformation of kaolinte to needle-like mullite (porcelains take these processes further). Thus, the formulation of stoneware is mainly about creating a matrix where this will happen while at the same time producing a body that is easy-to-form and dries without problems. Formulating stonewares is about being able to measure their physical properties (plastic, dry and fired) and adjust recipes accordingly (e.g. the DFAC, SHAB, LDW tests). Stoneware bodies need enough quartz so glazes do not craze, enough feldspar so that they develop the desired fired density (1.5% porosity, for example) and enough plasticity for the forming process (but no so much that drying problems arise). Throwing bodies, for example, typically have 5-7% drying shrinkage (any more than than will often mean drying cracks). Plasticity is easily achieved either by selecting more plastic clays or adding bentonite (often as little as 1% can make a difference). When white color is not required, iron-containing clays can be employed (these are often very plastic and less expensive). Low temperature bodies having strengths that rival high temperature stonewares can be made simply by employing fluxes that melt there. Terra cotta clays, for example, contain natural melters that will quickly densify and mature bodies as low as cone 02. Frits can be added to make stoneware at almost any temperature (if price is no object). Stoneware at cone 02? Yes. These test bars are fired to cone 02. The top body is 50:50 Redart and a silty raw material from Plainsman Clays (named 3D) plus some bentonite and 1% iron. The bottom one also has 5% Ferro Frit 3110. 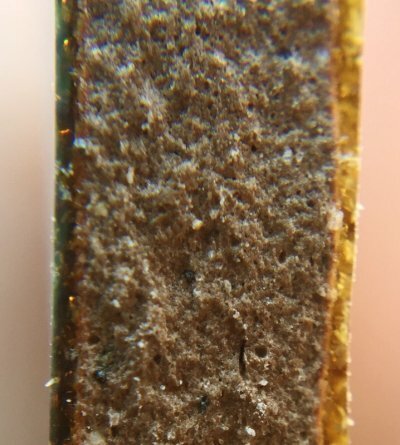 The porosity: The bottom one is 3%, the top one 8%. So each 1% frit reduces the porosity by 1% in this case. 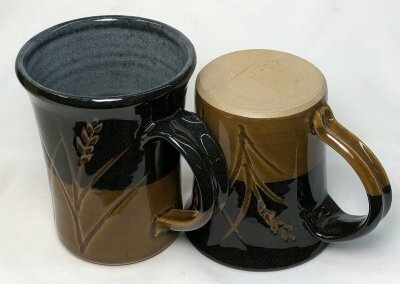 The mugs on the left are made from a moderate plasticity stoneware clay. On the right: A highly plastic porcelainous whiteware type body. On the left, there is not the slightest hint of a crack anywhere. Right: 3 s-cracks on the bases, 2 handles have separated completely at the bottom and all have small cracks at the join. It is little wonder that stonewares are preferred by potters, they produce much fewer rejects. The glaze is well melted, but the interfacial zone with the body is wider than terra cotta but much narrower than for porcelain. The body is developing glassy phases as does porcelain and stoneware and its color has changed from red to brown. However it is possible to add a frit and glass-bond the particles at cone 02 (at much higher cost of course). Not surprisingly, glazes must be more closely tuned to match the thermal expansion of the body for lower temperatures (since they are not stuck on as well). Materials are not always what their name suggests. 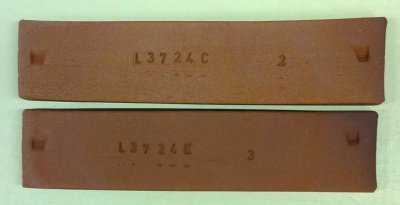 These are Lincoln Fireclay test bars fired from cone 6-11 oxidation and 10 reduction (top). The clay vitrifies progressively from cone 7 upward (3% porosity at cone 7 to 0.1% by cone 10 oxidation and reduction, bloating by cone 11). Is it a really fireclay? No. These were used in the early 1900s to make crocks up to 60 gallon size in the Medalta Potteries factory in Medicine Hat, Alberta, Canada. The metal barrel was fitted with a wooden base, then lined with paper. Then the clay was rolled up the side and surface finished. 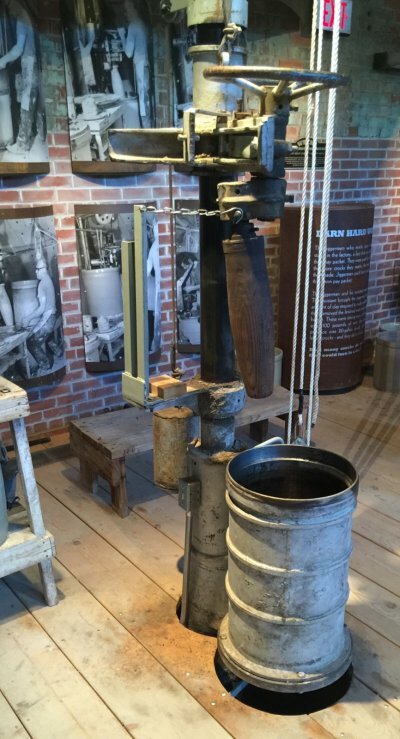 The barrel was then dropped and the crock removed. These were all made at the same time and dried in the same way. Left: Three out of five have cracked on the bottoms. Right: None have. Guess which is the porcelain? Of course, I could have been more careful and dried the porcelain ones more slowly. That is the trade-off, more care (and expense) to get a whiter more vitreous result. So, for production, it makes sense to use a stoneware if at all possible. Vitreous cone 6 stoneware. How? Producing a zero-porosity cone 6 stoneware is not as easy as you might think. 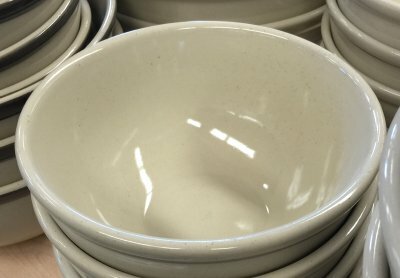 People expect stonewares to be plastic and fit glazes well. That means there needs to be lots of ball clay and silica in the recipe. These are refractory materials and they don't leave much room for the material that produces the vitrification: Feldspar. If the body does not need to be white there is another interesting approach: Use a red terra cotta material to supply plasticity and maturity. 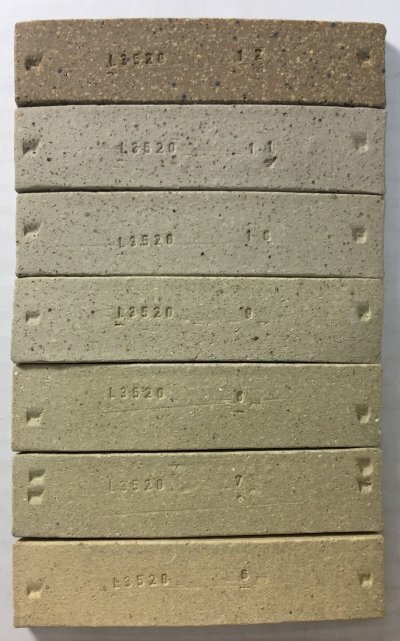 In this case I have made a 50:50 mix of a red-burning, super plastic, low fire clay (Plainsman BGP) with a refractory white-burning ball clay (Plainsman 3C). The result vitrifies to a zero-porosity, beautiful light tan body that even glistens in the light. One problem: Fired shrinkage. This body shrinks almost 17% from wet to fired. Left: 65% #6Tile kaolin and 35% Nepheline Syenite. It's white but crazes the glaze and has 1% fired porosity (measured in the SHAB test) so it does not have porcelain density. Plasticity is very good. Right: 65% M23 Old Hickory ball clay and 35% Nepheline Syenite. The glaze fits, it has zero porosity (very dense) and plasticity is fantastic! The body on the left needs 20% silica (to stop crazing) and 5% more Nepheline (to reduce porosity to porcelain levels), the remaining 40% kaolin will not be nearly enough for a workable plasticity (so bentonite will be needed). The body on the right does not need fixing, it works beautifully as is.